One of the things I like least about homeschooling is keeping a lesson planner. I accept the value of having one, but the planners that I have used just were a pain in the backside to maintain. I am horrible about keeping them up to date. Often, I have found that the lesson planners that you can purchase just don’t seem to fit our needs. So, this year I am doing something totally different. I bought a pretty pocket portfolio and 6 of the less expensive 2 pocket portfolios that do not have the metal prongs in them. These will be my lesson planner for the school year. To assemble the planner, I first cut the larger, pretty portfolio in half along the fold to create 2 covers. Next, I opened up the less expensive portfolios and refolded them so that the pockets were facing outward. The folded portfolios were stacked neatly in between the covers and spiral bound at the office supply store. Inside front cover contains a calendar sheet and the attendance record form that I downloaded from New Bee homeschooler. The second page contains a curriculum resource list showing what materials the kids will be using this term. Next page is a weekly planning sheet that I use to record any preps that I have to do for each week. This includes things like printing out worksheets, books to check out from the library, or any special supplies I may need to purchase. The next 4 pages are specific to our daughter: workbox planner (which also functions as a weekly lesson planner), an 8-week lesson planner for courses she is doing that are using materials not sold by Heart of Dakota, Reading logs, and her Unit Study Planning guide that covers the entire year. Following Little Miss’ 4 pages, I have 4 pages of the same forms for Pookie. 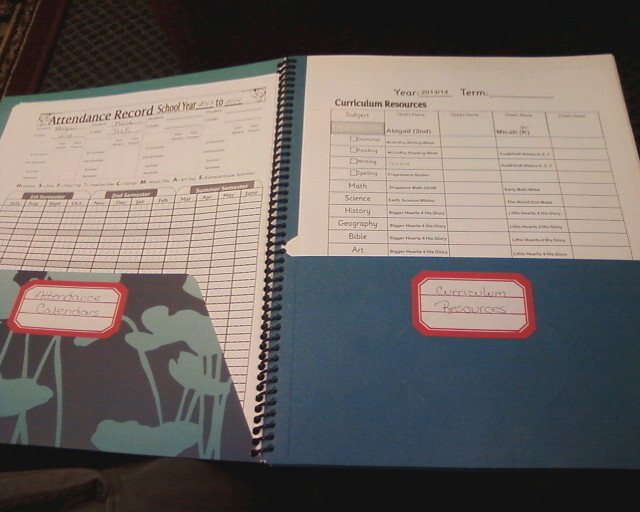 The last 3 pages will be used for each child’s grade sheets and field trip records. At the end of the year, I will remove all of the papers from their pockets, add a laminated front & back cover, then have them bound to make a more permanent record of the school term. I like this format as it will allow me to add as I go along. If I find that I need to make changes, it will be much easier than a bound lesson planning book would have allowed. In Oklahoma, we are not required to keep a portfolio of homeschool lessons. I decided to make one anyways. With Daddy on the truck all week, a portfolio is a great way to share with him the schoolwork completed. I started out with a 3-ring binder for Little Miss. Using the curriculum manual as a guideline, I made an index divider for each subject. Some of her lessons involve written work while others do not. When doing a thematic unit, that is often the case. Many lessons are a hands-on activity. Written work is easy. I simply use a hole punch on the page and add it to the appropriate section in the binder. This includes reading logs of books from the library or our home collection, copywork, and any paper that can be hole punched and added. Hands-on activities are a little bit more work. I take pictures with my cell phone and print them out from the computer. I size the pictures to allow me to fit as many as possible onto a sheet or two of paper. If you wanted to get fancy, you could do a digital scrapbook layout. Once the pictures are organized on the paper, print it out to add to the portfolio. A written sheet explaining the activity would be added with the pictures. Field trips, such as the one we took to the Oklahoma City Zoo, are treated the same. I have some field trip record sheets that I found online. You can find free printable sheets at http://www.abcteach.com/directory/homeschooling-and-parent-resources-field-trips-8931-2-1 I love this resource for the field trip forms. Instead of a simple record sheet, these are actual worksheets that require the child to participate. For example, the form for a trip to the zoo includes pictures of animals that have to be matched to their names. Some of their worksheets are for members only, but they have an assortment that are free also. A second resource that I use for field trip records is http://www.thatresourcesite.com/printables_for_homeschoolers_logs_learner.htm That Resource Site has a lot of fun and very useful forms on it! One additional thing that I am doing with Little Miss’ assignments is to type up her Grammar lessons. In the manual, they allow for you to simply discuss the lessons instead of having worksheets. To help Daddy see what she is learning, and to provide a review we can use later, I am typing the lessons on the word processor and printing each week’s assignment for her. One example being a lesson showing the difference between a sentence and a sentence fragment. I typed each with a blank line before each sentence or fragment. On the line, she wrote an “F” for fragment or an “S” for a sentence. Typing the lessons takes very little time, yet is is giving her something to show Daddy when he is home. Her Singapore Math workbooks are remaining intact. I won’t be cutting the binding on those to add to the binder. Any little books that she makes, such as her timeline book, are going to be added to the binder simply by tucking them into a pocket-style sheet protector. With her homeschooling, I am considering adding in the Keepers of the Home program that she is doing. It is a program from Keepers of the Faith. The projects include not only the homemaking skills and Bible character trait studies, but her academics too. 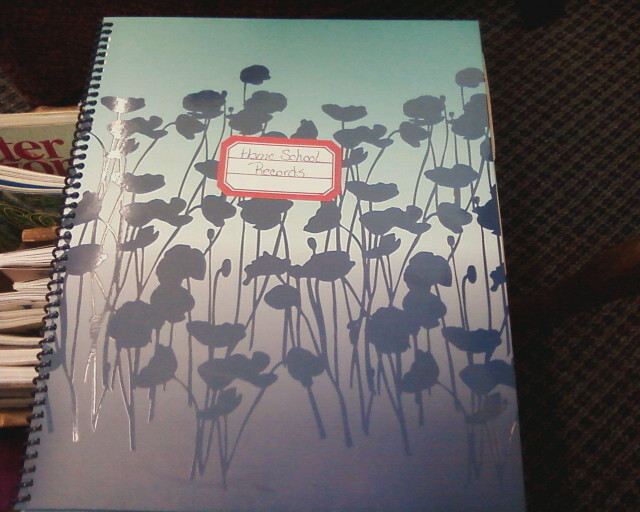 Keepers also has a program for boys. All in all, I am enjoying putting this binder together for her. It will make a nice record of what she has learned throughout the year.